The barley chromosome 3H accommodates many semi-dwarfing genes. To characterize these genes, the two-rowed semi-dwarf Chinese barley landrace ‘TX9425’ was crossed with the Australian barley variety ‘Franklin’ to generate a doubled haploid (DH) population, and major QTLs controlling plant height have been identified in our previous study. The major QTL derived from ‘TX9425’ was targeted to investigate the allelism of the semi-dwarf gene uzu in barley. Twelve sets of near-isogenic lines and a large NILF2 fine mapping population segregating only for the dwarfing gene from ‘TX9425’ were developed. The semi-dwarfing gene in ‘TX9425’ was located within a 2.8 cM region close to the centromere on chromosome 3H by fine mapping. Molecular cloning and sequence analyses showed that the ‘TX9425’-derived allele contained a single nucleotide substitution from A to G at position 2612 of the HvBRI1 gene. This was apparently the same mutation as that reported in six-rowed uzu barley. Markers co-segregating with the QTL were developed from the sequence of the HvBRI1 gene and were validated in the ‘TX9425’/‘Franklin’ DH population. The other major dwarfing QTL derived from the Franklin variety was distally located on chromosome 3HL and co-segregated with the sdw1 diagnostic marker hv20ox2. A third dwarfing gene, expressed only in winter-sown trials, was identified and located on chromosome 3HS. The effects and interactions of these dwarfing genes under different growing conditions are discussed. 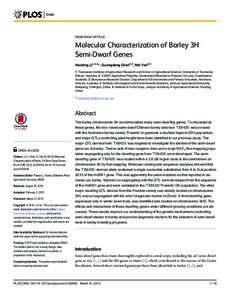 These results improve our understanding of the genetic mechanisms controlling semi-dwarf stature in barley and provide diagnostic markers for the selection of semi-dwarfness in barley breeding programs.